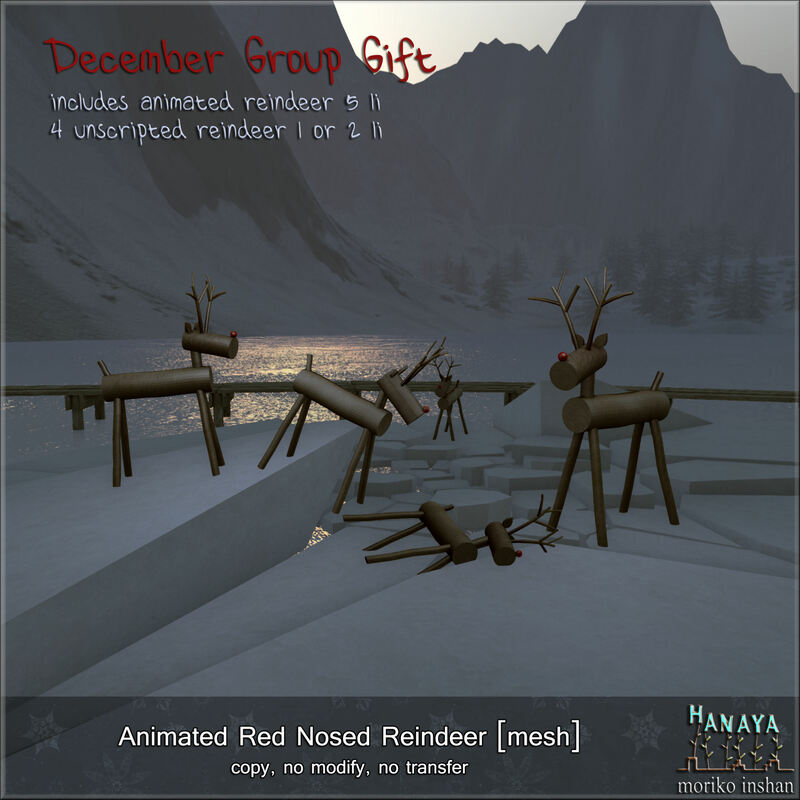 Gift sent out on both groups and Subscribe-O. 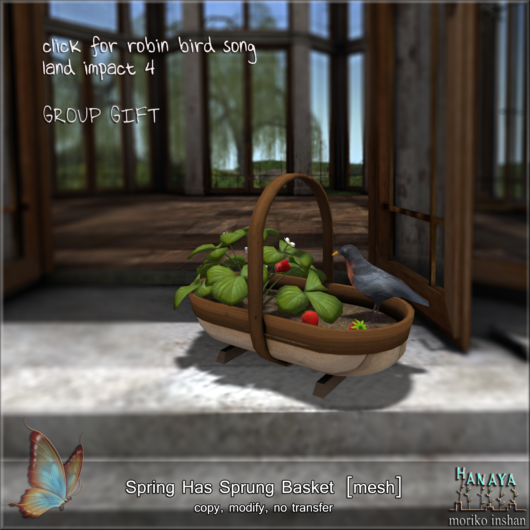 Also available in-world. 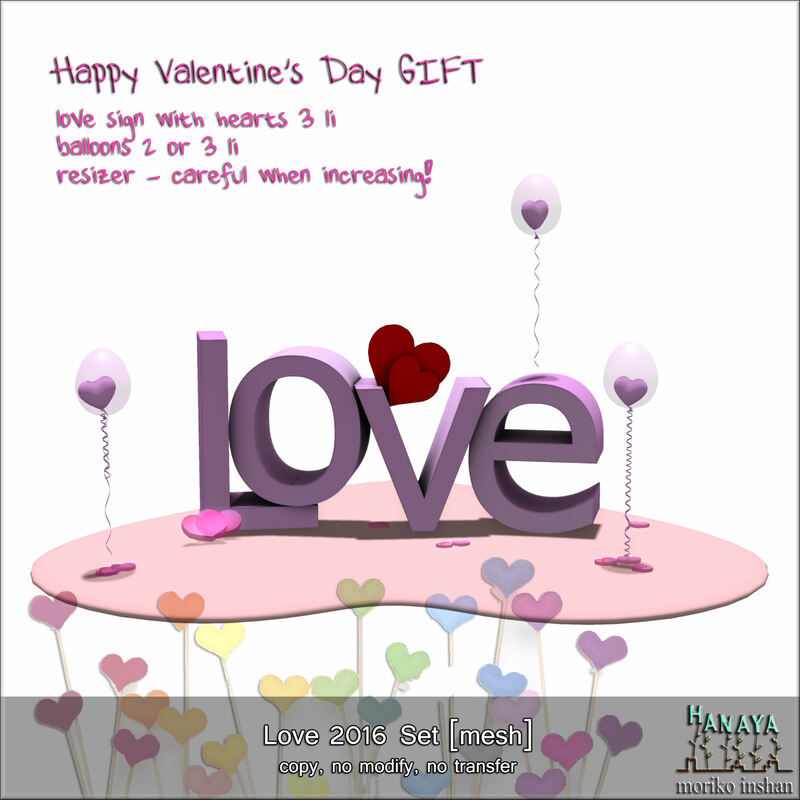 Happy happy! 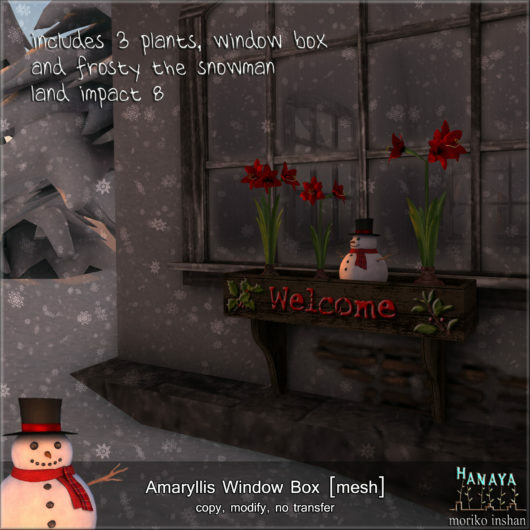 This entry was posted in Uncategorized on December 31, 2015 by moriko. 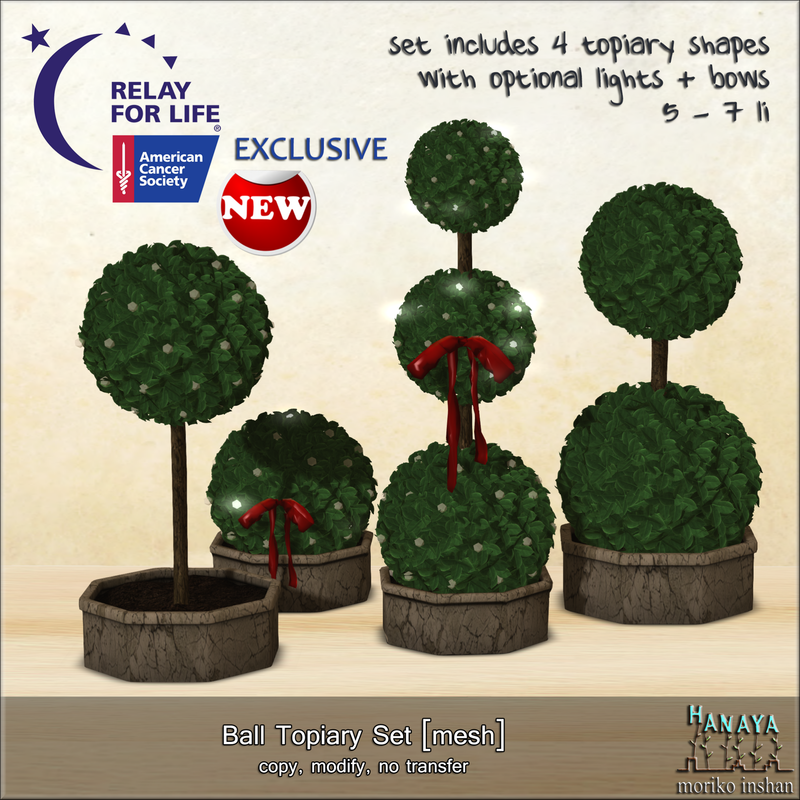 The -Hanaya- Illuminated Branches are only 1 or 2 li at provided size and are really cheerful. 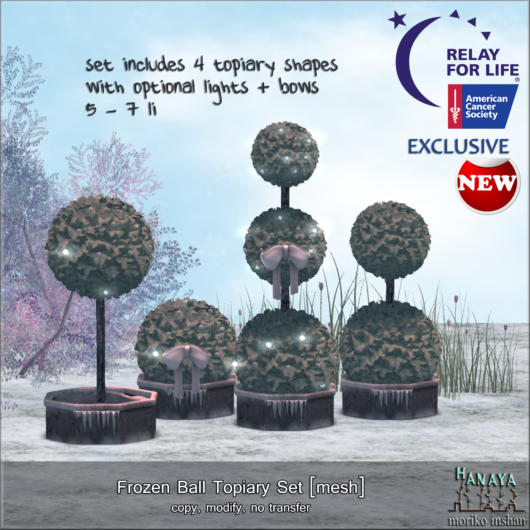 Three stencilled seasonal motifs on each barrel. And they are mod (and unscripted), so you can change the colour of the lights just by editing and tinting. Available at -Hanaya- inworld store and on the Second Life Marketplace. 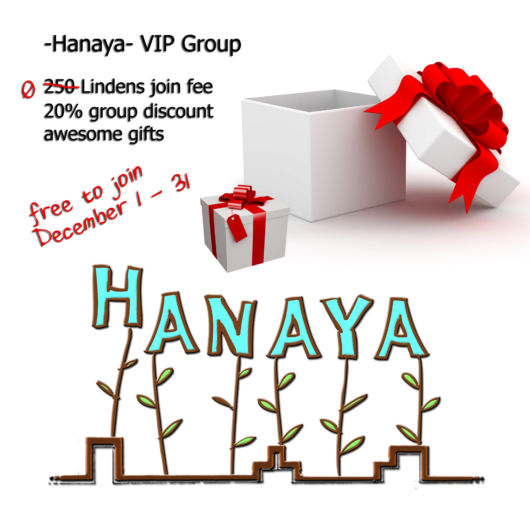 And just a quick reminder – the -Hanaya- VIP group is still free to join, so do it! 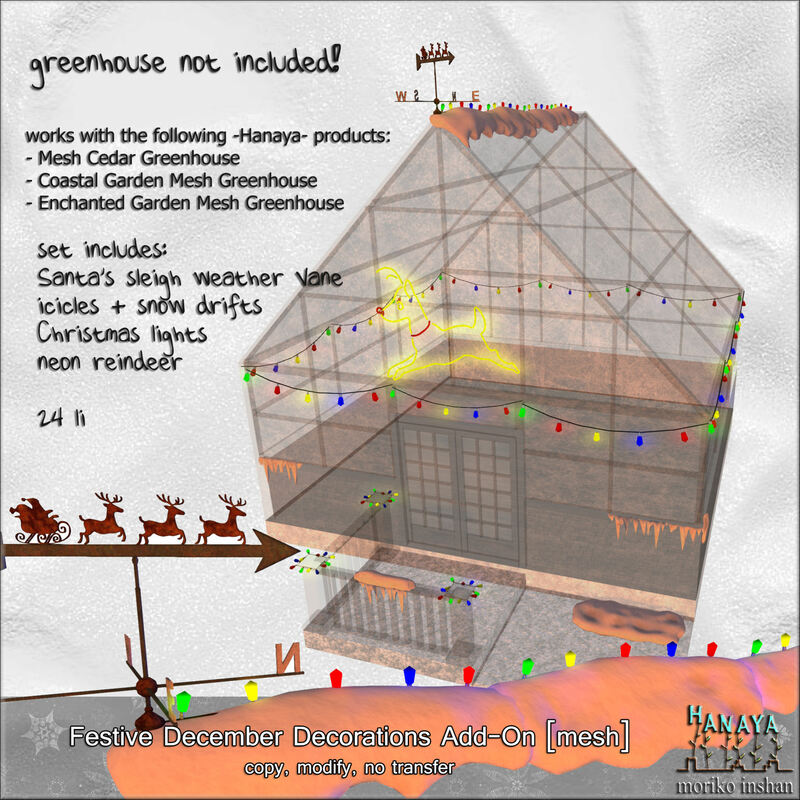 This entry was posted in Product Announcements on November 30, 2015 by moriko. 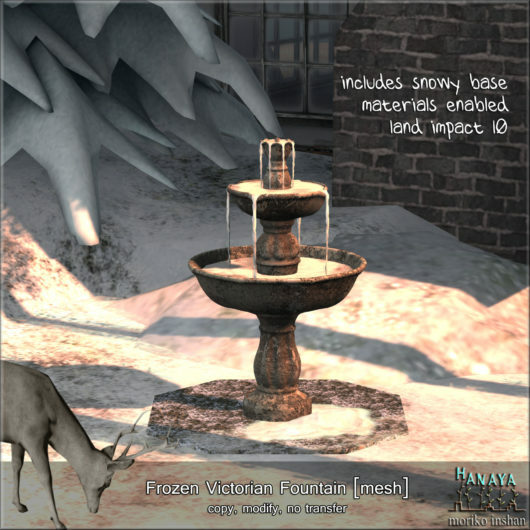 New from -Hanaya- for winter 2015 / 2016, the Frozen Victorian Fountain. 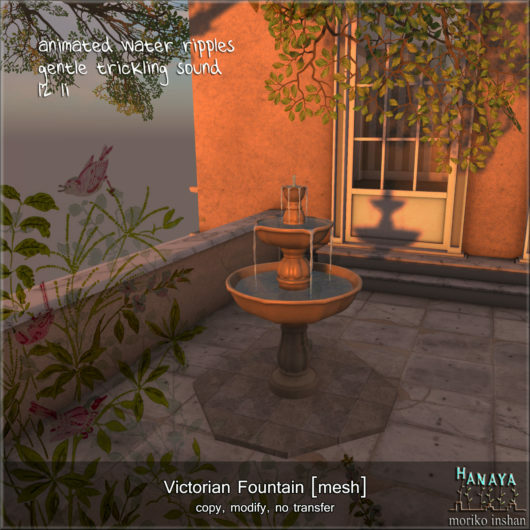 The winter version of our classic three tier fountain is a stunning water feature for residences and commercial areas, which adds an elegant touch of winter. Flash-frozen water seems to bubble from the top finial, caught in the act of trickling over scalloped tiers. The fountain’s wavy rims have divots to direct thin streams of water to the tiers below. Presented in carved stone, the fountain’s finish gives it a realistically aged appearance. Its beautiful design conveys warm natural stone highlights and shading in subtle organic tones as it stands on an octagon shaped pebble base with a drift of snow. 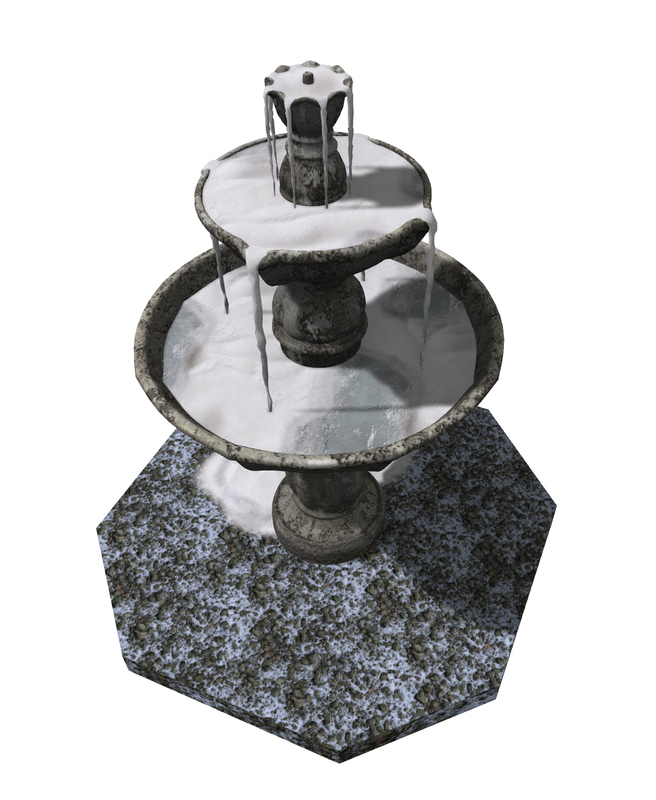 If you like, enable Advanced Lighting in your Graphics settings to see the fountain’s textures in 3-D quality. 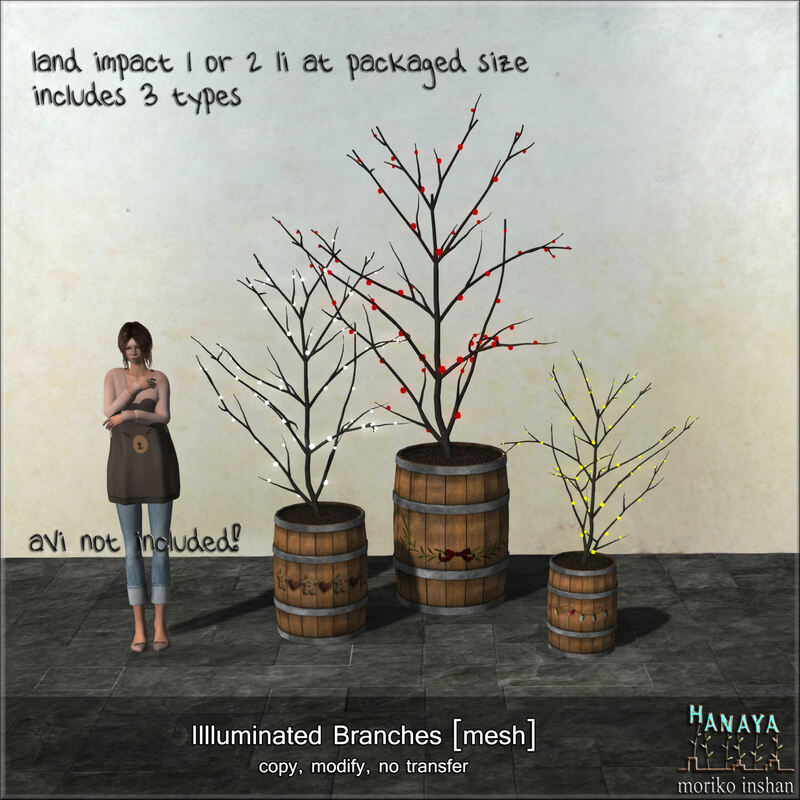 At the provided size of 2 x 2 x 2 meters, the land impact is 10 PE. The -Hanaya- Frozen Victorian Fountain is currently on display and available for purchase at -Hanaya- inworld store and on the Second Life Marketplace. 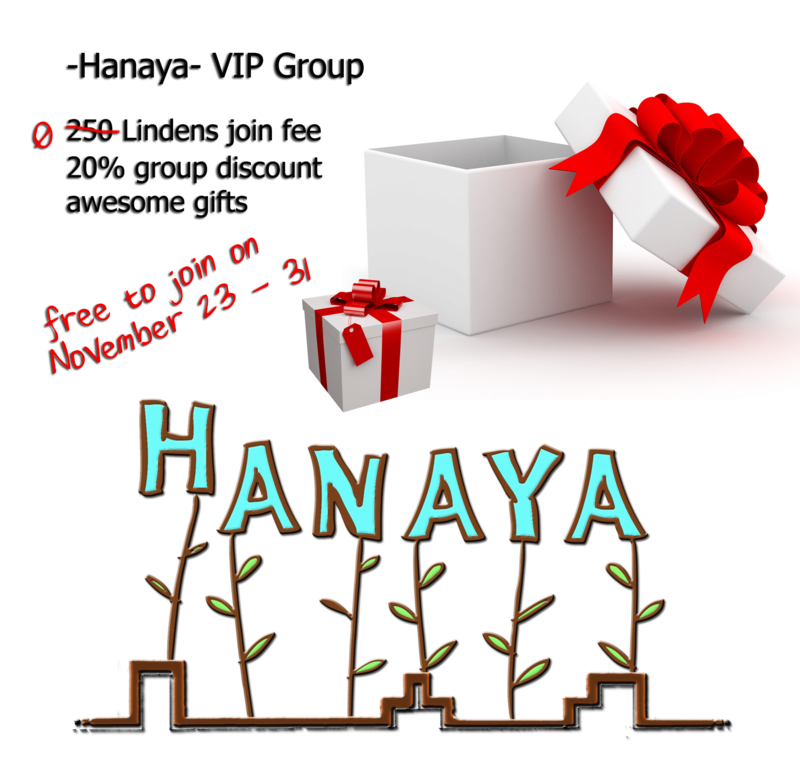 Eligible for inworld VIP group discount of 20% – please wear your tag! 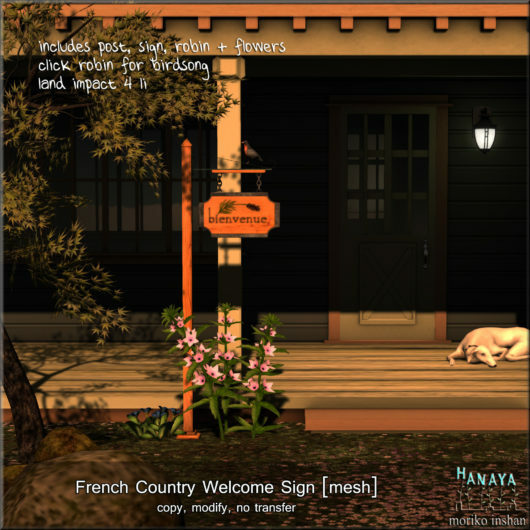 This entry was posted in Uncategorized on November 21, 2015 by moriko. create private cozy spaces in your home. The front features a peaceful county winter scene while the back has simple falling snow. Land impact at the provided size is 4 PE. The animated gif below has a bit of an interruption but he actual product animation is a neverending seamless loop. Please come see it in-store. 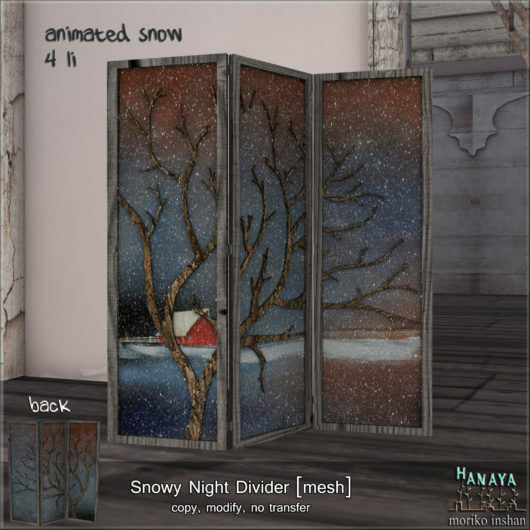 The Snowy Night Divider is currently on display and available for purchase at -Hanaya- inworld store and on the Second Life Marketplace. This entry was posted in Product Announcements on November 9, 2015 by moriko.